We provide all these cleaning services for new and used vehicles, Cars, Trucks, SUV’s, Boats, RV’s, Motorcycles and more. Fleet Service also available. Our auto detailing process includes an extremely thorough cleaning, polishing and waxing of an automobile, both inside and out, to produce a show-quality level of detail. 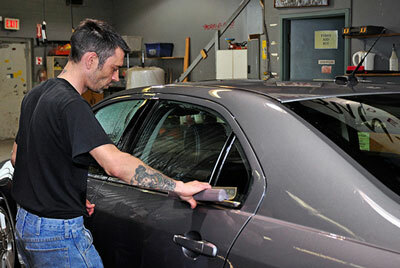 Besides improving appearance, detailing helps to preserve resale value of your car. Having your car detailed before you sell it can greatly improve the chances of a full purchase price sale, the benefits of car detailing and Oil Spray will save you money in the long run. Kitchener Waterloo’s premiere car detailing, auto cleaning, and rust protection specialists. At Dynomite Detailing our vision is to be identified as an industry leader by our customers, vendors, and employees for excellence in workmanship and satisfaction. If you want your car to go from shabby to shining, you’ve come to the right place, we offer you a full range of car cleaning services for your vehicle’s interior and exterior. Our professional cleaners take care and pay close attention when washing, waxing, and cleaning your auto. Regardless of your busy schedule, the convenience and flexibility of Dynomite Detailing provides you with many options for automotive detailing or oil spray and rustproofing needs, our prices are competitive and our customer service is number 1. Come to Dynomite for high quality car cleaning in Kitchener Waterloo! Monday to Friday: 8:00 am to 4 pm. Evenings and Saturday mornings: Available by appointment only. For service and pricing in the Kitchener-Waterloo area.